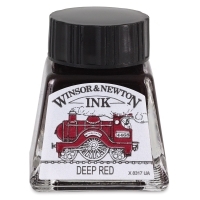 Winsor & Newton's famous drawing inks are formulated from a series of soluble dyes in a superior shellac solution. Apply them with brush, pen, or airbrush. They are widely used by illustrators, designers, calligraphers, and artists. These brilliant colors are fully intermixable, and they are easily diluted (with distilled water). Fast drying and water resistant, they have excellent adhesion on most surfaces. Each label has been individually designed, and contains a unique and whimsical illustration that features the color itself. Many of Britain's finest illustrators contributed to the series. No wonder that the colors sets have become one of our favorite gifts for illustrators! Note — Dye-based colored inks are exceptionally brilliant, but their colors should be considered fugitive. Consider them to be an illustrator's medium, used to create original works for scanning or reproduction. Avoid bright light when displaying them, and use UV-protective glass. Introductory Set No. 1 — Contains eight colors, including Black (Indian Ink), Blue, Scarlet, Canary Yellow, Emerald, Nut Brown, Orange, and Violet. Introductory Set No. 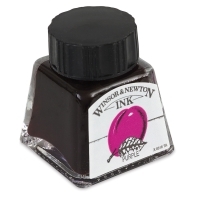 2 — Contains eight colors, including Black (Indian Ink), Brilliant Green, Deep Red, Peat Brown, Purple, Sunshine Yellow, Ultramarine, and Vermilion. 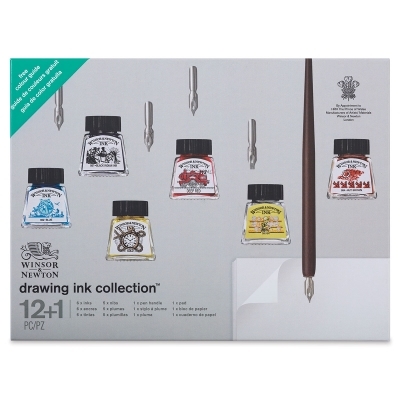 Drawing Ink Collection — Contains six 14 ml bottles of Drawing Ink, a wood pen handle, five metal nibs, and a cartridge paper pad. The different nib shapes allow for a multitude of strokes and expressions. The colors contained in the set include Blue, Gold, Black Indian, Deep Red, Silver, and Nut Brown.